Internet Protocol version 4 (IPv4) is the fourth version in the Internet Protocol (IP) development and is the first protocol version which was widely deployed. 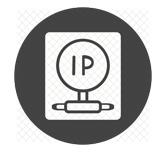 IPv4 is described in IETF publication RFC 791 (September 1981) by replacing an earlier definition (RFC 760, January 1980). This tutorial will help you to understand IPv4 and its associated terminologies along with suitable references and examples. This tutorial is useful for beginners which help in understanding the basic concepts of IPv4 needed to work with any TCP/IP based protocols. After finishing this tutorial, you will gain a moderate level of expertise of IPv4 from where you can take yourself to next levels. Before starting with this tutorial, candidates should be aware of basic computer and network concepts like what is a protocol, use of protocol, Network Layers, etc.